This recipe comes from Ree-Pioneer Woman and they are delicious! 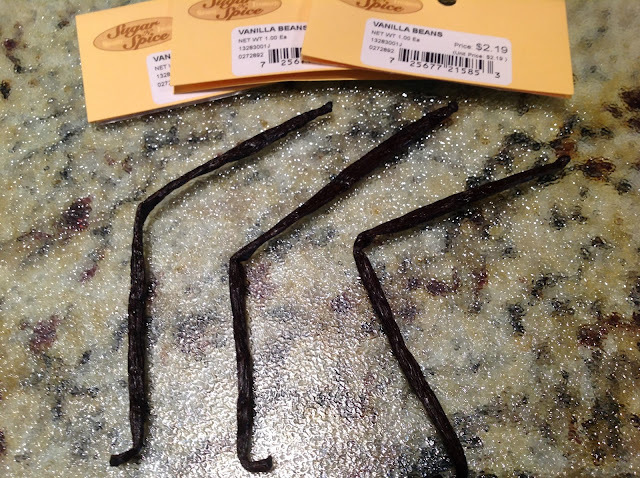 It took me forever to make this recipe because once I found out how much a vanilla bean costs (about $5-$7 each), I couldn't bring myself to buy three of them. I searched every grocery store for the lowest price and found them at Woodman's grocery store for $2.19 each and then at Costco for $11.99 for 10. If you think ahead you can also buy them online for a good price. I've made these scones several times and they are so worth it. 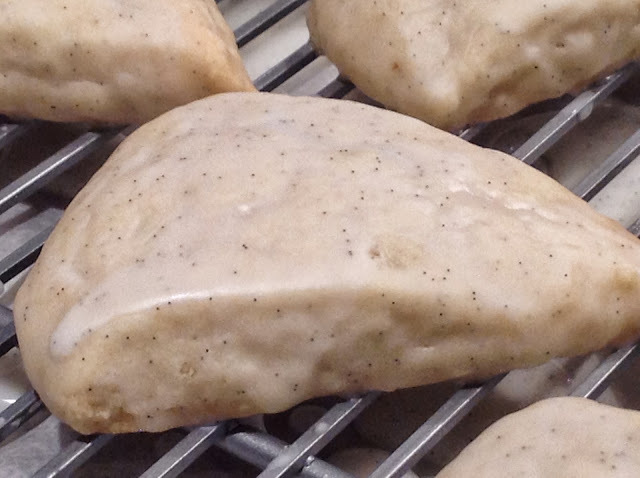 They are tender with a hit of vanilla and are slightly sweet from the glaze. They freeze great and only take about 20 minutes to thaw so you can enjoy them with your morning coffee whenever you want to treat yourself. 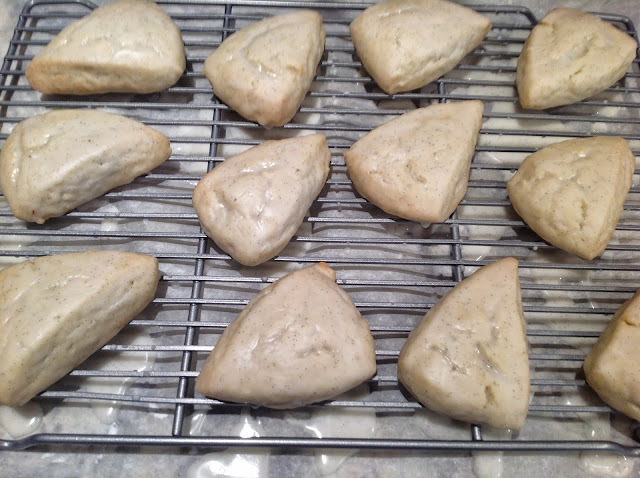 The first time I made these scones I followed Ree's recipe exactly but then I tried to make it easier by using a food processor and then shaping them differently. I also don't make as much glaze as she does because she covers the whole scone in glaze and I just covered the top. Sometimes my shortcuts don't work out but this time they did and the scones were just as good as the originals. For whatever reason I don't enjoy the time it takes to cut the butter into the flour but a food processor does it in a snap with a few pulses. Shaping the dough into 3 circles was easier than trying to get the dough into a large rectangle like Ree does. 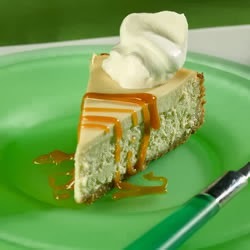 She makes it look so easy as I saw her make these on her Food Network Show. 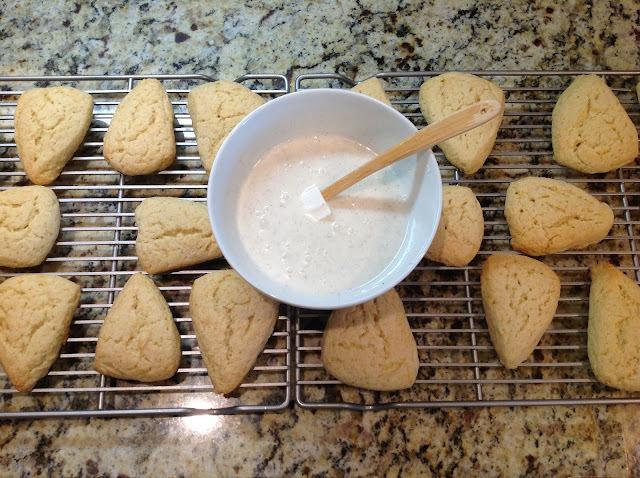 Check out her blog post for her recipe as she shows 31 step by step photos! Put foil under the rack to catch the extra frosting for easy cleanup. 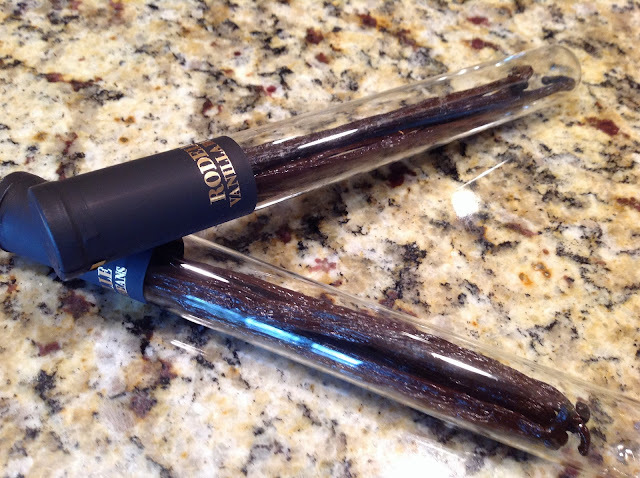 Split the vanilla beans down the middle lengthwise and scrape out all the vanilla "caviar" inside. (Click here to see how to use a vanilla bean) Stir caviar into cream. Set aside for 15 minutes. 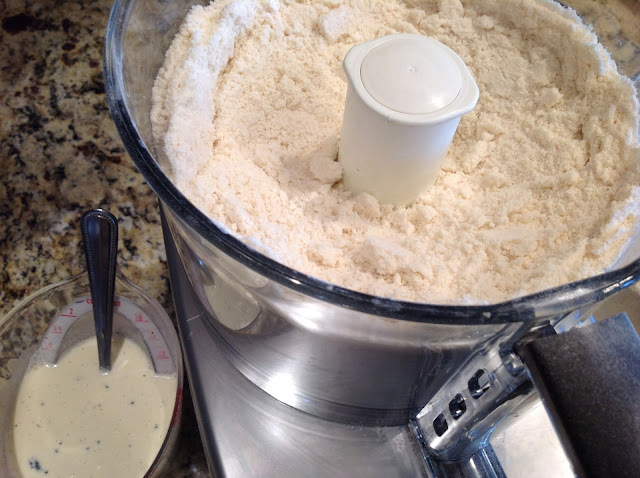 In a large food processor add Sift flour, sugar, baking powder, and salt. Pulse a few times to combine. 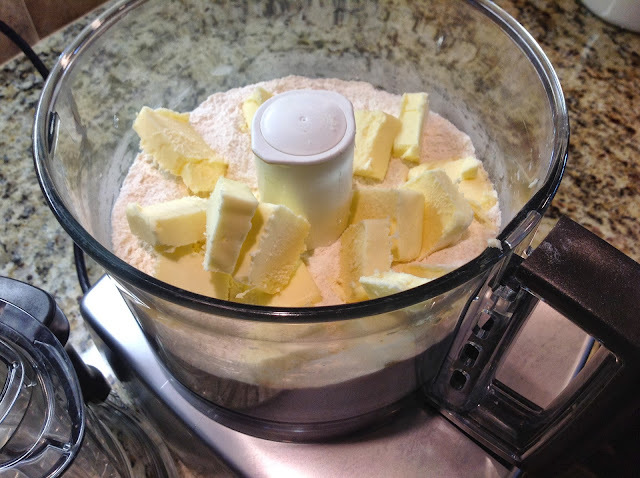 Cut cold butter into pats, then add to the flour mixture in the food processor. Pulse until the butter in cut into the flour. Mix vanilla cream with egg, then combine with flour mixture; pulse food processor until it comes together. 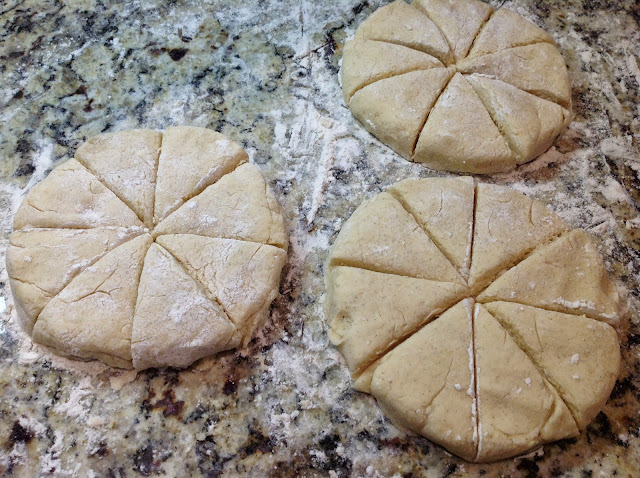 Turn dough onto a floured surface and divid into 3 equal portions. Using your hands Lightly press each portion and form into three circles about 1/2 inch thick. Then using a knife or I like to use a pizza cutter, cut each circle into 8 pieces. Transfer to a parchment or baking mat-lined cookie sheet and bake for 13-15 minutes, removing from the oven just before they start to turn golden. Allow to cool for 15 minutes on the cookie sheet, then transfer to a cooling rack to cool completely. To make the icing, split one vanilla bean in half lengthwise and scrape out the caviar. Stir caviar into milk; allow to sit for awhile. Mix powdered sugar with the vanilla milk, adding more milk if necessary to get the right consistency. Stir or whisk until completely smooth. You'll want consistency to be thin enough (but not too thin) to dunk top of scone into glaze and then let excess drip off. One at a time, carefully dunk top of each cooled scone in the glaze. Transfer to parchment paper or the cooling rack. Allow the glaze to set completely, the glaze will be dry to the touch, about an hour. Scones will keep several days if glazed or freeze using wax or parchment paper between layers so you can easily remove and they won't stick together. ENJOY! Those look delicious! Perfect for company over the holidays! Thanks Abbey! The best part of this recipe is being able to make ahead and pull them out whenever company comes over for the holidays. Perfect easy appetizer for parties and holidays. Thanks for sharing. Good luck in Vegas I watched u on the today show, told Lois that eliszewsis r goin to be in Vegas next weekend also. Thanks Aunt Mary! Getting super excited to go, it's all I can think about! I'll have to look up Tami on fb and let her know where we will be staying but if you see her, tell her Aria. We will be there Saturday-Tuesday. When we get back we will have you, Hartman's and Markley's over. It would be great to see you all! Dawn - Watched you on the Today show and saw your picture with Kathie Lee Gifford. Best of luck in Las Vegas! Thanks Marilyn and Mary. NY was so much fun! Now Vegas in just a few days….it's so EXCITING!